President Rivlin pays condolence call to family of Border Police officer Solomon Gavriya, who was killed in Har Adar terror shooting. 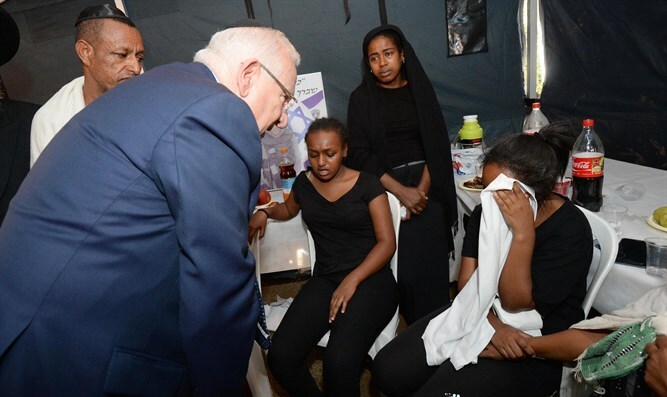 President Reuven Rivlin paid a condolence visit to the family of Solomon Gavriya in Beer Yaakov, who was killed in a terror attack in Har Adar Tuesday along with two others when Nimer Mahmoud Ahmed Aljamal opened fire with a stolen pistol. Gavriya's parents related to Rivlin that Gavriya had been wounded in a stabbing attack a year ago and was released from combat service but stubbornly insisted on returning to his unit with his friends. Rivlin hugged Gavriya's mother, telling her that "what can I tell you, your pain leaves us speechless. Your child is a real hero who saved so many children from the hands of a cruel murderer." Solomon's quick response to the shooting prevented the terrorist from infiltrating Har Adar. On Tuesday, Police Commissioner Roni Alsheich praised Gavriya for preventing further carnage, telling reporters that "their quick response led to the terrorist's death. Had they not returned fire, he would have continued on his murderous mission". The Border Police Commander spoke about Gavriya's self-sacrifice, his connection to his friends and his devotion to his family. Rivlin encouraged Gavriya's brother and sisters to support their mother during this difficult period and said that he hoped to see them again in happier circumstances.